Stand in a river and catch a fish! Fish and Sons Kenai Charters welcomes you to an experience like no other. This is your chance to stand in a river and become part of the flow of nature again. This river is why we live here. To feel the water slip by and dig our roots in, raise our families at the waters edge and cherish what will forever be one of the last great frontiers. Find out whats around the next bend in the Kenai River! Father and son guide training! Who is Fish and sons? Fish and Sons Kenai Charters is owned and operated by Erick Fish, long time Upper Kenai River drift boat guide. Raised in the midwest fishing the farmponds, creeks and rivers of Missouri, I heard a calling from Alaska and never looked back. Bringing a bag of tricks with me I set out to explore every nook and cranny of the Kenai River. As soon as I made a discovery I would turn around to realize everything had changed! 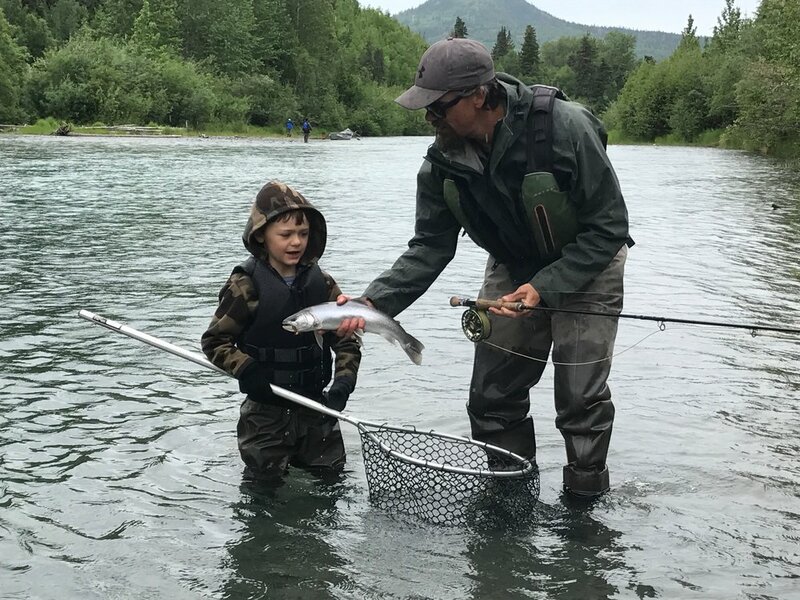 What an opportunity I was given and soon my desires led to wanting to share the Kenai River and provide an example of how to care for her and still reap the bounty she provides. Cooper Landing is my year round permanent home, the place I am raising a family and an area I feel strongly connected to. Fish and Sons goal is to immerse you as much or as little as you want to be and take the edge off life demands. Don't we all just need to go out, relax and catch a few fish? I do, quite a bit. The future of Fish and Sons? Who knows but little Wolfgang Fish can already slay some pretty nice trout! Of course we love to fish! Our day however is not my day to get them. You are 100% the focus of Fish and Sons Kenai Charters. With over a dozen years Kenai River guiding experience we can put you first and put you on the fish. Fish and Sons will accommodate anglers of all types and will help the individual in everyone have the best time possible. Fish, fun, friends! Every day is a great day on the river and I hope to help make it happen. The guide and a young angler. These are great moments! Our goal is to take you fishing for many years to come. Fish and Sons is happy to help you in any part of your booking an Alaska fishing adventure. We are locally owned and operated and can help recommend lodging, other guides and the best the Kenai Peninsula has to offer.